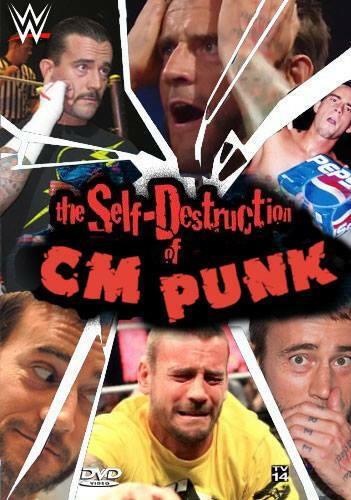 Headlies: WWE Releases “The Self-Destruction of CM Punk” DVD - WrestleCrap - The Very Worst of Pro Wrestling! Des Moines, IA – During this week’s edition of Smackdown, WWE announced that they are releasing a brand new DVD entitled “The Self-Destruction of CM Punk”. The release comes as a surprise as there had been no previous mentions of the DVD being written, filmed, produced, and shipped to stores. 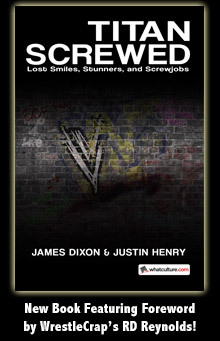 Punk, who recently quit the company, was not interviewed for the DVD. Instead, the WWE relied on “those who know him best as handpicked by Triple H himself” to give their perspective on his tumultuous career. Interviewees include Triple H, Stephanie McMahon, Kevin Dunn, Brooklyn Brawler, Batista, Teddy Hart, and Elijah Burke. Several of Punk’s matches will also appear on the DVD, including his feud with Mike Knox over Kelly Kelly, losing his title to JBL on Raw, and all his matches against Ryback. The DVD will be available in all retail locations and streaming on Netflix, Hulu, Amazon and the new WWE Network. It will also be included in all copies of Triple H: Thy Kingdom Come and The Complete History of the XFL 10-disc box set. 20 Responses to "Headlies: WWE Releases “The Self-Destruction of CM Punk” DVD"
That insinuates that we ever loved Batista in the first place. I’d totally buy this if it was real. Could totally see this happening if Vince wasn’t around. Looks like fun for the whole family. WWE might as well just make this a series. Pretty sure they have no shortage of guys they can use and then eventually make nice with and induct into the Hall of Fame. I wear skinny jeans! Deal with it! I sooo want the “Complete History of the XFL” dvd box set. I posted this on another site’s group, I’m a member of and I guarantee you I’ll some people actually believe this is real, it’s so funny. I love the pictures you picked to use on the DVD cover! And to think, any other piece of WWE merchandise always has CM Punk’s Pepsi logo deleted/blocked out. I’d buy the XFL box set if they also threw in a The Rise and Fall of the World Bodybuilding Federation DVD. Wow a Self Destruction of CM Punk DVD and no Kevin Nash input?! Feels incomplete or destined to a sequel. I think it feels incomplete without Matt and Jeff Hardy. I would love to see a tongue-in-cheek trailer for this DVD from WWE if C.M. Punk ever comes back to wrestle there.